So began a text message from my daughter-in-law Alison. I was curious. The message was about how Alison had successfully used Parent Effectiveness Training’s Method III, no-lose problem solving, to deal with a conflict with her two year old daughter Zara, my granddaughter. As all parents can attest, two year-olds can be very vocal about asserting their choices and autonomy. This new found independence is in fact normal and healthy. A young child’s developing sense of self is a sign that the young child recognises that they are a separate person to their parent. The problem for parents is how to deal with the many frustrations and conflicts that arise because of this. Choosing to use power and deny the child’s needs is fraught with further conflict and power struggles. Choosing to deny the parent’s needs and give in to the child’s wishes is also problematic, with the parent resenting the child and the child missing out on opportunities to learn empathy and help others to get their needs met . Zara did not want to brush her teeth and I wanted her to, Alison’s text continued. When I spoke with Alison later she expanded on the story and told me how she had used no-lose problem solving to resolve the situation. Alison had previously participated in a P.E.T. course that I conducted last year when Zara was less than 18 months. “Me no brush teeth!” Zara emphatically replied to Alison’s request. For most parents the statement of NO from their child can immediately trigger a feeling of panic, of needing to control the child, of thinking the child is naughty and disobedient. Understanding Parent Effectiveness Training (P.E.T.) 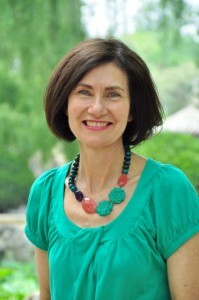 Alison chose to view the behaviour through a different lens. She realised that children are always behaving to get their needs met and it is a parents role to guide children to find alternate solutions to getting their needs met if their behaviour is unacceptable to the parent. “You really don’t want to brush your teeth”. By acknowledging Zara’s feelings Zara had a better chance of regulating her emotions and as a result listening to her mother. “No!” Zara replied a number of times. Alison actively listened again and then assertively (using a confrontive I-Message) and calmly facilitated the problem solving process. With that statement Zara ran into the Lego room (a play room where there is a display of some of my son’s Lego and where he and Zara play with the Lego together). “You want to brush your teeth in the Lego room”, Alison acknowledged. 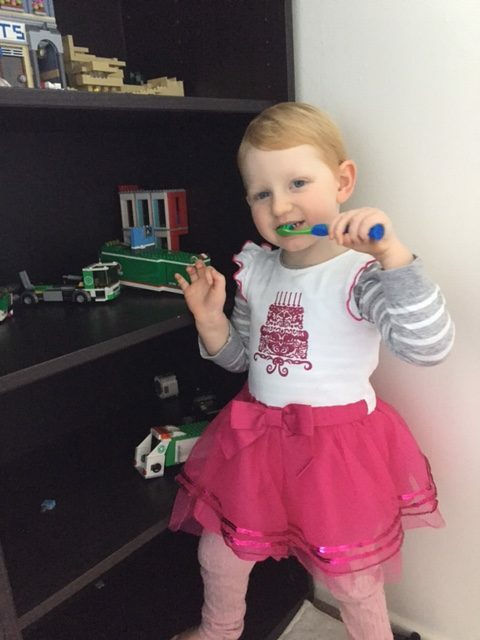 Alison proceeded to retrieve the toothbrush and paste from the bathroom and when she returned to the Lego room Zara had her mouth open waiting. Alison was delighted. No tears! No exasperation on either side. A peaceful result that allowed a toddler to grow in independence, emotional intelligence, and keep a relationship loving and connected. Parent’s needs were met and so were the child’s needs. But how do you know a child’s needs and what were Zara’s needs? With young children it is often guesswork for the parent, most likely however Zara’s needs were for independence and to make the teeth brushing task interesting and fun. With toddlers and two year old children fun is a huge need and mundane tasks that can be turned into fun games make for children who are happy to co-operate. 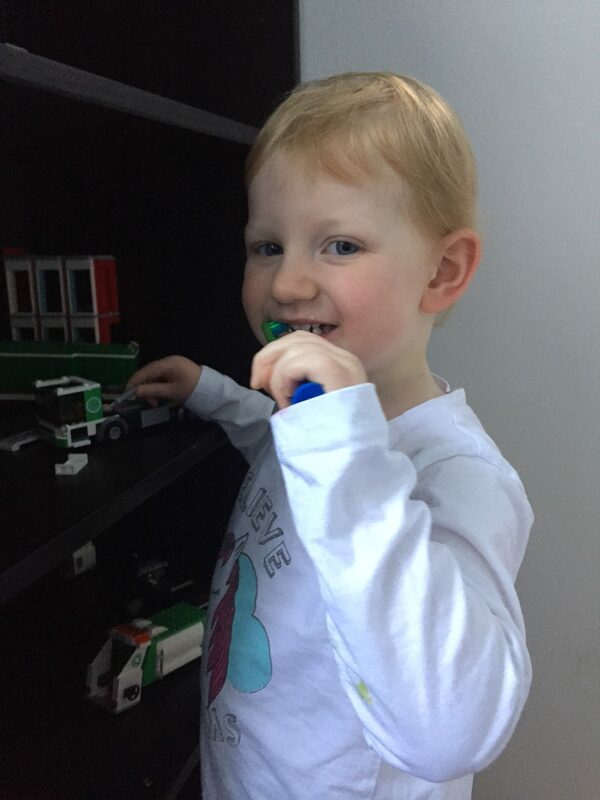 PS: Zara requested that her mother join her to brush her teeth in the Lego room too. Alison happily obliged.